The neighbors down the road don’t live in the classy part of town next to the river. The nest they live in is a bit unkempt. Okay, let’s be honest, this place is a trash bin, a pig sty, a garbage dump. I’ve never seen an osprey nest that looks a bad as this one. What a mess! I’m thinking hoarders. Home sweet utility pole in the middle of a vacant lot. 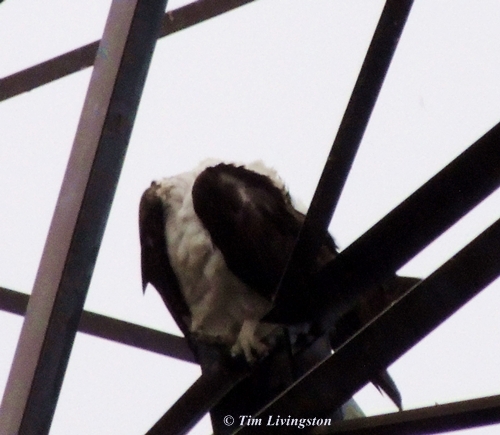 I showed the above pictures to “our” resident osprey in the high-rise tower with the river view. I was curious to get their reaction to the neighbors abode. The inter-species humiliation was just too much for him to take, and then……..
No osprey were injured in the making of this post. This entry was posted in Wildlife, Wildlife At The Mill and tagged nature, osprey, photography, sawmill, wildlife by foresterartist. Bookmark the permalink. Great series of pictures! I think this Osprey family must be known in the community as The Griswolds! Perfect name! I mean, they’re just trashy enough, you know?! But as you said before, they live in the poorest part of town! Oh! give a chance!!!! It is true they don’t have a huge steel high-rise with a commanding view of the river and all it’s fish. Where an osprey can sit in it’s perch spotting fish all day long without so much as a flap of the wing. No, the poor osprey have to fly over a mile to reach the river and over a mile back after they secure their meal. Uphill both ways! Life is not fair. *GUFFAW* you are hysterical Tim ! They must have Woodstock’s genes.. mind you that is some great distance away.. great pictures. Thanks Doron. One has to wonder why they choose to build a nest like this! WAIT, I’ve got it! Obviously they are ARTISTS! Exactly, but don’t try it at home… you might end up on a long, high post, living the Osprey artists way. And I dare say that the results might be “shocking”! 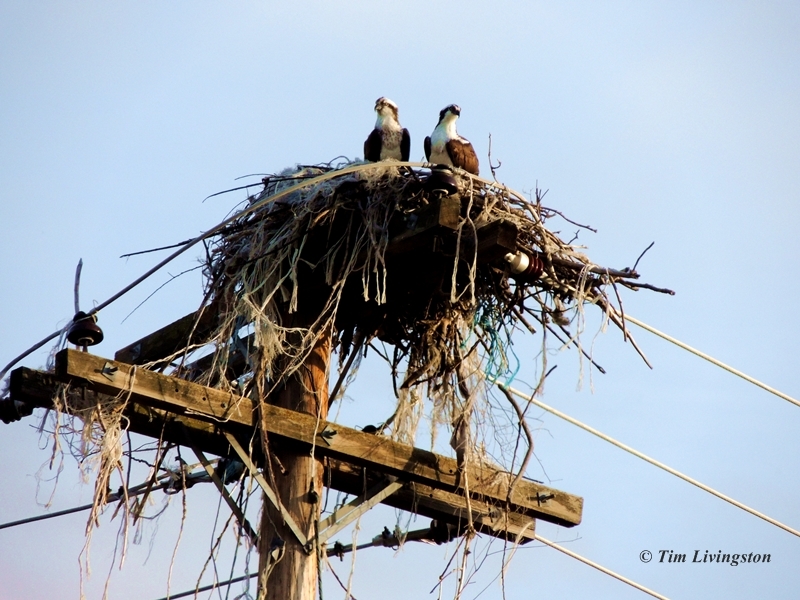 I’d never seen an Osprey nest…have nothing to compare this unkempt example to. Sure did enjoy watching these little raptor missles plunging into Lake Chelan in Washington state last year though…completely fearless, or very hungry, or both. 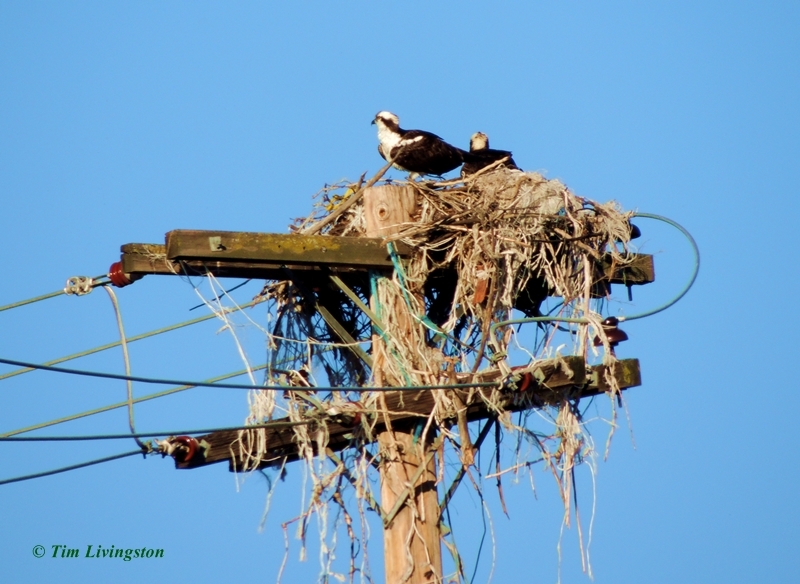 Great series of shots of what I would think is a poor choice for nesting – a power pole ? Surely some power company worker will be along soon to sort out their living arrangments, or are they protected enough to do as they please? This disheveled mess of a nest has been there for years. 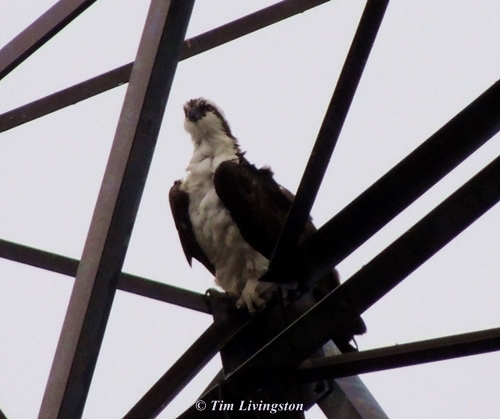 Sometimes the power company will take them down, but the osprey usually just build them back. The nest I’ve been following at the mill was torn down last year and the birds immediately built it back. I’ve taken lots of picture of various osprey nests that I will be posting in the next few weeks and you can see how different this nest looks. There should be osprey around your neck of the woods. If you keep an eye out I’m sure you will eventually see one. Lots of buzzards…and big ones. Think they pretty much intimidate everything that doesn’t eat at the beach..like the pelicans and egrets. I can always tell when something dies. Hilarious, I’ve just choked on my coffee! That was awesome and hilarious! That is indeed a trashy nest, I’m impressed, and very amused by your story! These are CUTE! Loved them and the titles are perfect. This is all great! I have seen power companies go as far as putting up another pole to persuade the osprey to move. To no avail. Have any of you seen eagles chase osprey to get their catch of the day? Its facinating! 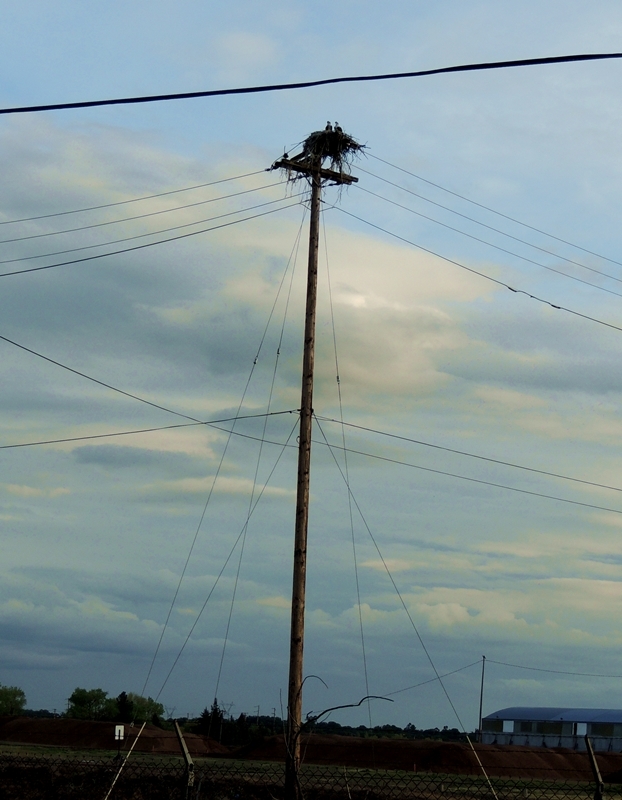 They put nesting platforms on some of the poles the osprey like, to get them above the wires. The osprey often use them. I once saw a bald eagle chase an osprey for a fish. He harassed the osprey until it rolled into an upside down position while in flight and let go of the fish. In mid air the eagle caught the fish and flew away. I have seen that happen too. The eagles harass the osprey until they give in. It is a spectacle, the osprey the looser. There used to be a larger community of osprey here but the eagles have made a big come back. Actually, I think I figured it out after going over it with Doron. These osprey aren’t slobs! They are artists and their creativity is simply spilling over! I’m chuckling…. Thanks for sharing these. My goodness, I could not stop laughing over this one 🙂 Love the photos!